Spacious two bedroom/two bath condo at Puamana in Princeville. This condominium has an open floor plan with vaulted ceilings. The large master bedroom/bath suite is located in the upper loft and has a large walk-in closet and sliding doors out to a private lanai. The second bedroom/bath is located on the main floor and has its own lanai. 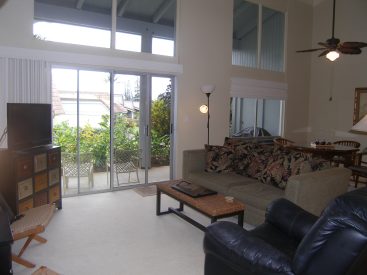 There are sliding doors from the living room to the covered lanai where you can enjoy dining and relaxing. The outdoor storage closet is located off the lanai. Furniture and furnishings are included. Puamana allows pets. Amenities include a swimming pool and a resident manager. It is just a short walk to the Westin Resort or take the near-by trail down to Anini Beach.